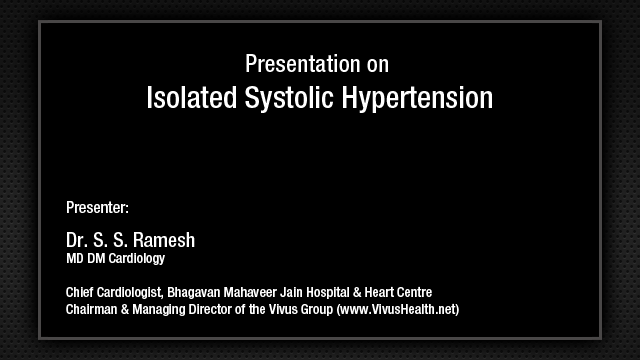 RAAS INHIBITORS IN THE MANAGEMENT OF SYSTEMIC HYPERTENSION. How old is this system? The system has been present in the body ever since man has been created, but inhibiting this system has come into vogue for the past 30 years and all of you would have been listening to lectures at least for the past 20 years on ACE inhibitors and 10 years on ARBs, so I have nothing much to add. I will just highlight a few points about how these drugs are being used. I apologize for this poor slide. This is a slide, which shows the renin-angiotensin aldosterone system and 4 sites where its activity can be inhibited, which means if you either block the angiotensin here or angiotensin precursor before it is getting converted into the active angiotensin II or the renin directly or before the renin is produced. These are the 4 sites where they can be inhibited so that blood pressure could be controlled. Renin is inhibited before production by adrenergic blockers. Once it is produced, it can be inhibited by direct renin inhibitors, which are into the market for the past 3 years at least and once renin acts on the substrate and produces angiotensin I, which is a decapeptide and this is not a very active principle. It has to be converted to the octapeptide, which is angiotensin II by the ACE inhibitor. ACE inhibitor is an enzyme, which converts angiotensin I to active angiotensin II and angiotensin II has got 2 major functions, directly it will cause vasoconstriction and increase the blood pressure, it can indirectly increase the aldosterone synthesis, sodium retention and increase the blood pressure. So, either you block in the final stage or you block in the entry or in between, so there are 4 places where renin-angiotensin aldosterone system could be inhibited to bring down the blood pressure. What is the function of angiotensin II in a normal person? 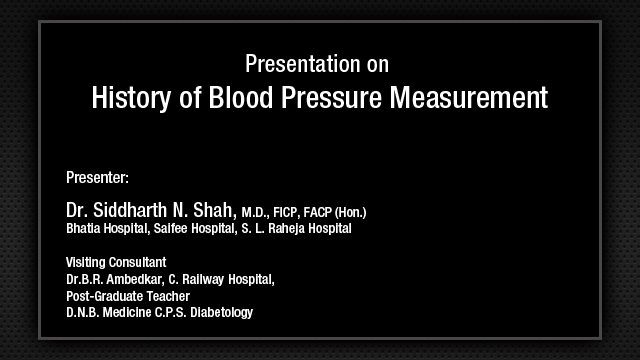 Once we know that it is very easy to conclude how when it is inhibited, it is helpful in the treatment of hypertension. Angiotensin II on the end-organ brain, it produces atherosclerosis, vasoconstriction we have already seen. It involves vascular inflammation and hypertrophy and it causes endothelial dysfunction. So, angiotensin II on the brain can produce so many bad effects and on the left ventricle, it can produce left ventricular hypertrophy, fibrosis and apoptosis and the remodeling and on the kidney because it causes efferent vessel constriction, it increases the intraglomerular pressure and therefore it increases the proteinuria and therefore it also causes the glomerulosclerosis. So, all these things are caused by angiotensin II and naturally, when we inhibit the angiotensin II, we can have the opposite of all these things, which means the stroke can be reduced, the left ventricular hypertrophy can be reduced, the apoptosis and remodeling can be reduced and proteinuria above all can be reduced, which is a boon for all the nephrologist and chronic kidney disease patients. Now, when we go into the evolution of drugs, from 1960 to 1980, the whole antihypertensive market was ruled by beta-blockers, which is now having a dull period or a lull period. In early 1980, the ACE inhibitors were introduced even though it was highlighted after the HOPE trial by Salim Yusuf after 1990, it has really hit the market. Now, late 1990s, the ARBs came into market and in 2007, the direct renin inhibitors have come into the market. Now, starting from 1940s with a peripheral sympatholytic agents and ganglion blockers, which we are using only in resistant type of hypertension now a days followed by thiazide diuretics in 1957, which are still ruling the market of antihypertensive drugs, a dull period for beta-blockers, are now currently it is being reigned by the ACE inhibitors and ARBs and direct renin inhibitors. When did they discover this? One of the major discoveries of this century in cardiovascular pharmacology was the isolation of the ACE inhibitor from snake venom Bothrops jararaca. Bothrops jararaca is a South American viper, which is mainly seen in Paraguay. From this only in early 1980s, they found out the ACE inhibitor. In the early 1980s, the first ACE inhibitor, captopril was introduced and this is the bible for all of us cardiologist. Lionel Opie says in his book on angiotensin-converting enzyme inhibitor introduction, he says in my opinion this class of drugs has earned the labeling of CARDIOPROTECTIVE DRUG of the 1990s. There is no doubt about it. It is not just a treatment; it is protection of the cardiovascular system. What is vaso-protection? Today, nobody is worried about the chronological aging. Everybody is worried about the vascular aging. I see many of my teachers here who have never aged vascular wise, but they have only aged chronologically, thanks to probably ACE inhibitors and their method of living. The vascular protective effects of angiotensin II blockade we have already seen. Just to mention them again: Direct antiatherogenic effect; antiproliferative effect; restoration of endothelial function, actually it restoration of endothelial dysfunction; protection from plaque rupture; antiplatelet effects; antihypertensive effects; and decreased oxidative damage in general. In reno protection, we have already seen it decreases proteinuria and decreases the activity of tubuloglomerular feedback and decreases mesangial influx of macromolecules and decreases formation of superoxide anions. So, summary to the unique features of the ideal angiotensin receptor blockers are: It causes a double digit decrease in blood pressure for 24 hours, early morning risk coverage is there, superiority on receptor binding, no dosage adjustment for hepatically and renally impaired patients, no drug-to-drug interaction or no drug food interaction and BP reduction without changing the circadian rhythm, excellent tolerability and high response rates, better end-organ protection, and 24-hour risk coverage with once daily dosing. Because whenever we require an antihypertensive drugs, many people take it only from the day of the prescription that is being written for a few more days or weeks and still better patients take for a few months and then come and tell us when they develop the the complication, you gave the drug, I felt very well and then I stopped the drug. So better tolerance, we will have to insist that the treatment is lifelong so that the life is long and also we tell them it is better to take it only once a day, then they are able to follow it. Now, as I told you, I am not going to give you all the details about ARBs and ACE inhibitor with which you have been bored for at least 10 years of listening to that. The summary of this is: All-cause mortality. When you give a drug whether it definitely reduces the all-cause mortality, you have seen the 88,860 patients with 7 ACE inhibitor trial, ACE inhibitor is better than the control and the P value is very significant. It definitely improves all-cause mortality, which has been done with most of the available ACE inhibitors. Now, come to ARB, with 77,000 patients, it is still better marginally, so it is just still better marginally than the control in reducing the all-cause mortality. Then, what is the conclusion of this. Among RAAS inhibitors only ACE inhibitors have demonstrated a significant 6% mortality reduction in hypertensive patients. No significant reduction in all-cause mortality with ARB, but still it shows a marginal improvement in the all-cause mortality. Perindopril significantly reduced all-cause mortality by 13% among contemporary patients with arterial hypertension. Treatment with the ACE inhibitors would additionally save 12 lives for every 1000 patients treated for 4 years. Now, this Blood Pressure Lowering Treatment Trialists' Collaboration Committee has analyzed 29 trials and that concluded like this: Similar, net effects on total cardiovascular events with ACE inhibitors, calcium channel blockers, diuretics, and beta-blockers. ARB is also effective in reducing total cardiovascular events. Calcium channel blockers may be less effective for prevention of heart failure, but more effective for stroke prevention. This is mainly due to larger reductions in the BP, there is larger reduction in stroke. So, size of reduction of BP is more important than the choice of the drug. Most important is how much it is able to reduce. Now, the same meta-analysis given in this graphical way, you can see the stroke is reduced both by the ACE inhibitor and by the ARBs, you can see, there is a 1% reduction with ACE inhibitor and 2% reduction. This is of the analysis of 29 trials, not a single trial and heart failure is definitely reduced very much by both the things that is why they are first introduced in the treatment of heart failure and when it comes to coronary artery disease, it is definitely reduced by the ACE inhibitors and probably there is a big controversy about this probably by the angiotensin receptor blockers. What is the original thinking when ACE inhibitors were introduced? When ACE inhibitors were introduced in 1980, the original thinking was that it is effective in unilateral renal artery stenosis. How did they think about it, you all should be remembering the Goldblatt kidney in which you tie one kidney and produce ischemia that kidney produces a lot of renin and increased secretion of renin leads on to increased angiotensin II. That means the contralateral kidney functions more to maintain the blood pressure and therefore they develop high blood pressure. So, the original thinking was if you can give the ACE inhibitor to these patients, you will cause a slight reduction in the BP to the affected kidney where there is unilateral renal artery stenosis, but you will make the other kidney function better by controlling the excessive angiotensin that has been secreted by the ischemic kidney. Is that true? Then, they found the damage to the affected kidney can be much more if the patient has been pretreated with the diuretics and if the patient has got a low sodium, but even today if the patient has got unilateral renal artery stenosis, you can still use ACE inhibitors or ARBs provided you should not have used diuretic and that patient should have a normal sodium. That is the take home message that is now rethinking after 1977. ACE inhibitors in unilateral renal artery stenosis: It is expected that the ACE will adversely influence this patient, but ACE could be initiated without diuretics and with the patients on normal sodium diet. 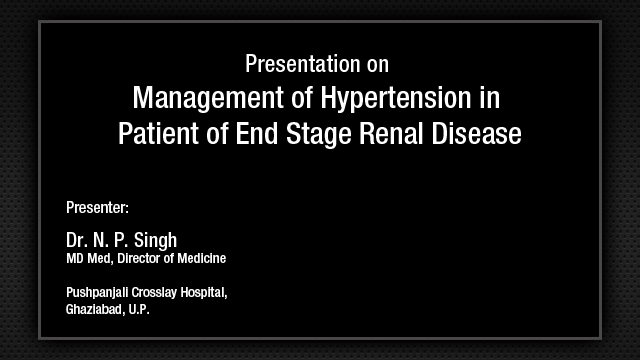 This will remove the adverse effects of excess circulation angiotensin II on the normal contralateral kidney. Then, can we use it in bilateral renal artery stenosis? Preferable to avoid, because what happens is when you expose the patient, you do not know, you have not investigated with renal Doppler study, you are exposing the patient on ACE inhibitor, within 2 months' time, the patient comes with worsening renal functions. The diagnosis is most probably the patient has got bilateral renal artery stenosis. If you have not done a renal artery Doppler before starting a younger patient or even an older patient with bilateral atherosclerotic renal artery stenosis, if he comes with problem of renal failure, sudden onset, acute onset within 2 months, the best thing is probable diagnosis is bilateral renal artery stenosis, better avoid, investigate further and change over to some other drug. Choice of initial drug: There had always been a question with every JNC, which drug to use first. Now, all the collaborative studies have clearly proven all the drugs are equal in reducing the blood pressure if given in moderate doses. So, whatever you want to use that is why JNC-7 will finally say it is a physician's discretion to use the recommended drug, but how do we select from. There are certain things that we can go by. In the past, choice of the initial drug was largely based on the perceived differences in the efficacy of lowering BP and the likelihood of side effects, so if the side effects are more, you may not tend to use it. Now, most trials have found that moderate doses of all classes of drugs provides similar efficacy, that is to lower the BP by 10% in most patients. So, more reduction than that, the patient is not able to tolerate, less reduction the doctor is not able to tolerate. Thus, any group of drug could be the choice of initial drug except probably a lone beta-blocker. (The person who is going to talk about beta-blocker is going to fire me). Combination therapy: Now, the next question is whether our drug can be combined with other drugs? A low-dose of thiazide diuretic potentiates the effects of all other drug classes, so this is most important, why alone beta-blocker is never advised. When a beta-blocker is combined with a diuretic, the effect is as good as the any other drug that is given as a single or a first-line drug, but when you do not combine it, naturally like atenolol it loses its effect. So, a low-dose diuretic can be combined with a second-choice drug widely advocated and is used, that is why lot of combination with hydrochlorothiazide or chlorthalidone better still is now available with a drug A, C or beta-blocker. Now, against this is the ACCOMPLISH trial. In ACCOMPLISH trial, they tried 2 arms, one with benazepril and amlodipine and the other one with the ACE inhibitor and the diuretic. Now, what happened, ACE inhibitor, benazepril and calcium channel blocker provided a 20% greater reduction in the relative rates of cardiovascular morbidity and mortality then the same benazepril and diuretics. Therefore, despite equal reductions in BP with a 2 combinations, this combination of calcium channel blocker with amlodipine provided a 20% greater reduction. So, what is the conclusion? The first and second choice will be ACE inhibitor, ARB plus calcium channel blocker and would be the initial and the second drug and diuretic would the third choice. Today, the person who is going to talk about combination treatment will definitely talk about polypill of all these 3 things: calcium channel blocker, ACE inhibitor or an ARB, and then a diuretic. Why diuretic in the third, is after the ACCOMPLISH trial. Once daily dosing: So, these are the problem, which one to start first, can it be a single drug, and can it be a combined with other drug. Now, once daily dosage when it comes, most available drugs in all the classes provide full 24-hour efficacy. The prudent course is to document the patient's response at the end of dosing interval on the next day with this abrupt surge in BP could be avoided. Now, everybody says when you want to give a single drug to hypertensives, give it in the night so that the physician gets a satisfaction that the early morning surge of BP could be controlled, but many of our patients feel comfortable by taking a drug after the breakfast. They do not take it in the night. So, what we have to do is to find out whether it really has got a 24-hour coverage. Before he takes the next morning dosage, we will have to call him and recheck the BP at least on 2 or 3 different occasions and ensure ourselves and the patient that there is a real 24-hour coverage. That is why today people prefer olmesartan because they say it covers for 36 hours. Even if the patient forgets dosage, it still controls the blood pressure for a prolonged time, so it is our duty to call the patient and recheck whether there is really a 24-hour action of these proposed drugs. This is again a poor slide, which is to highlight the guidelines today after all these trials. Initial drug of choice in uncomplicated hypertension and initial drug of choice in patients with diabetes. When you take the National Heart Foundation of Australia, the initial drug of choice in uncomplicated hypertension is ACE inhibitors, ARB, calcium channel blocker and diuretics. Diabetes, ACE inhibitors and ARB. Canadian recommendation, diuretics, beta-blockers, ACE inhibitors, ARB and CCB, choose whatever you want. When it comes to diabetes, ACE inhibitors and ARBs. European Society of Hypertension, what it says is all major classes including diuretics, beta-blockers, calcium channel, ACE inhibitors and ARBs and all major classes here also. The British Society Guideline and the NICE guideline (National Institute of Clinical Excellence) from Britain, both of them say the same thing. Less than 55 years old or non-black ACE inhibitors or ARBs or beta-blockers; less than 55 years old or blacks, you try diuretics and beta-blocker or calcium channel blockers, so ACE inhibitors and ARBs even in there for diabetic people. The JNC-7, the first choice is diuretic. WHO, the first choice is diuretics and initial drug of choice is combination of medication that should be an ACE inhibitor or ARB-based regimen in both the things. So, majority are accepting, you can use any drugs at your discretion because all of them reduce the BP to the same level, so use them in moderate dosage, but in diabetics, prefer to use ACE inhibitors and ARB. Even in other patients also and nondiabetic also, if you can achieve a very good blood pressure control, please use ACE inhibitors and ARB. Now, the other question is, Professor Pahalajani has already talked about loss of libido, the next is diabetes. Which are the antihypertensives that can produce new-onset diabetes. Two things that do not produce are ACE inhibitors and ARBs, so we would prefer to use those drugs rather than Odds ratio, which is in favor of diuretics and beta-blocker and mildly towards calcium channel blockers, so prefer to use a drug, which will not produce a new-onset of diabetes. What is the paradox: A paradox was created in 2006 circulation that ARBs may increase the risk of myocardial infarction and then another paradox was a meta-analysis of large number of patient in the ARB trial suggested that telmisartan, losartan, candesartan, valsartan may be associated with cancer incidence and mortality in 2010 oncology publications. Where do we stand now? Now, recent evidence is conclusion for meta-analysis in BMJ in May 2011, there is firm evidence to refute the hypothesis of ARBs increasing the risk of MI ruling out even a 0.3% absolute increase, so it does not increase the cardiovascular event, especially MI. Compared with controls, ARBs reduce the risks of stroke, heart failure and new-onset diabetes. Cardiovascular News, June 13, 2011, FDA concludes no cancer risk with ARBs from meta-analysis of 31 clinical data. This is what is from the FDA on June 2, 2011, the US Food and Drug Administration today announce that a group of medication used to control high pressure called ARBs do not increase the risk of developing cancer in patients using medications after going through 1,55,000 patients in 31 trials. So, will these 2 groups of drugs will stand the test of time like the digoxin, which is more than 200 years old or like the aspirin which was found out even though during the period of Socrates in 1853, it was found out as a chemical and 1899 Bayer called it as aspirin and is selling all around the world more than for 100 years now in cardiovascular medicine and the third drug that is still standing the test of time is what was introduced in the 1867 by Lauder Brunton nothing but amyl nitrite, today in the best of the forms, nitrate. So will these ARBs and ACE inhibitors will they stand the test of time like these 3 drugs, we have to wait and see, I think they have already stood for 30 years.